Oklahoma Connection | Westbrook joined the Oklahoma City Thunder with the fourth overall pick in the 2008 NBA Draft. Westbrook’s “Why Not? Foundation” is dedicated to supporting community-based education and family service programs while encouraging youth to believe in themselves. This past year, Westbrook became the first player in NBA history to average a triple-double in consecutive seasons. After leading the league in assists during the 2017-18 season, he became the only player in NBA history to lead the NBA in scoring and assists in subsequent seasons. A seven-time NBA All-Star, Westbrook became is one of three players all-time to record 15,000 points, 5,000 assists and 4,000 rebounds all before turning 29 (Oscar Robertson and LeBron James). Westbrook received NBA MVP honors at the conclusion of the 2016-17 season after becoming just the second player in NBA history (Oscar Robertson) to average a triple-double. During the season he set an NBA record by registering 42 triple-doubles. With 104 career triple-doubles, Westbrook ranks 4th all-time behind only Jason Kidd (107), Magic Johnson (138) and Oscar Robertson (181). After blocking his 200th shot this past season, Westbrook became the only player in the history of the NBA to record 200 blocks, 5,000 assists and 15,000 points within 700 games. Moreover, Westbrook is one of two active players (LeBron James) to own 6,000 career assists and 4,800 rebounds. With two scoring titles and a pair of NBA All-Star game MVP awards under his belt, Westbrook has helped the Oklahoma City Thunder become one of the premiere organizations in all of professional sports. Since the start of the 2008-09 season, the Thunder has amassed the second-best record in the NBA. Additionally, the Thunder joins the Spurs as one of two teams to finish with an above .500 record in each of the last nine seasons. 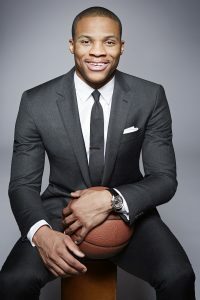 Westbrook is a seven-time All-NBA player and the winner of an Olympic Gold medal after helping lead the United States Men’s National team to a perfect 8-0 record during the 2012 Olympic Games in London. Beyond Westbrook’s accomplishments on the court, he has taken a leading role in advancing the state through his community and philanthropic efforts. Westbrook’s ‘Why Not? Foundation’ is dedicated to supporting community-based education and family service programs while encouraging youth to believe in themselves. Whether it’s serving Thanksgiving meals to the homeless, giving away shoes and backpacks to children during the holiday season or opening another one of his signature ‘Russell’s Reading Rooms,’ Westbrook has made it a top priority to better the community in which he lives. In 2015, Westbrook was recognized with the NBA’s season long Community Assist Award for his philanthropic efforts. See pictures of Russell Westbrook and other media HERE.